The full title "Trios Op. 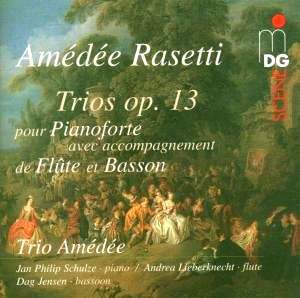 13 pour Pianoforte avec accompagnement de Fl�te e Basson" displayed on the CD booklet might suggest that the Paris-based, though possibly Turin-born, Rasetti composed these trios for some particular set of performers. After all, how frequently does the bassoon so prominently feature in Classical chamber music? But apparently the composer and his publisher were just keeping all their bases covered: the original edition of Op. 13 offers the choice of flute or violin, and of bassoon or cello. One would be tempted to call this a sort of eighteenth-century Gebrauchsmusik, save that such a dismissal would belie the distinctive character of each of these trios, not to mention Rasetti's own individual compositional voice. Thus, the F major Trio begins rather conventionally, with the piano's melodic lines and Alberti basses dominating the texture, while the other two instruments reinforce accents. But Rasetti uses development and variation techniques to build a considerable head of steam, transforming this Allegro molto into an exhilarating romp for all three instruments. Similar techniques carry the central Andantino beyond the squareness of its opening bassoon theme. The finale, Allegro assai, has a cheerful opera buffa bustle; there's a witty touch when bassoon and piano are "stuck" on a stuttering repeated note before bursting into the recapitulation. The opening of the C major Trio feints at turbulent minor-key drama before abruptly settling into a contented major mood, where it stays. The Romanza offers another bassoon solo, this one soulful; the flute, in response, lightens the atmosphere, until the music breaks into a sort of Gypsy-dance motion. The final Rondo, once more, offers a busy opera buffa energy. The bassoon writing includes some rather quick runs - did Beethoven know this trio when he composed his Fourth Symphony? The B flat Trio, in its turn, differs markedly from its predecessors in style and construction. The piano has the first paragraph to itself, and later in the movement punctuates the structure with cadenza-like flourishes. Lilting, gracefully pointed woodwind phrases throw the predominant broad, flowing melodies in sharp relief. Flute and piano begin the central Siciliana movement in a gentle, rocking motion, with the piano supplying light embellishments; soon, mysterious, creeping bassoon-and-piano scales disturb the serenity. Here the finale, entitled Belle Raymonde, is a theme and variations working all the standard changes on its stately theme: downward bassoon scales, flute triplets, rippling piano scales, even a fugato based on the theme's gruppetto motif. The exuberant playing of the Trio Am�d�e, founded in 2000, offers persuasive advocacy. I was particularly impressed by pianist Jan Philip Schulze's crisp fluency, even more in his delivery of the C major's quick series of turns (track 4, 6:28) than in his unfailingly pearly, precise passagework. At times, Rasetti reinforces the two woodwinds with a full chord in the piano - a tactic familiar to anyone who's reduced, say, a Broadway show score for a six-piece pit band - and these players bring off the intended illusion of a fuller wind complement. In fact, it's hard to imagine the alternative string instruments in this music - surely a tribute to the Am�d�e's musical intelligence and quality of execution. The recording quality is excellent.